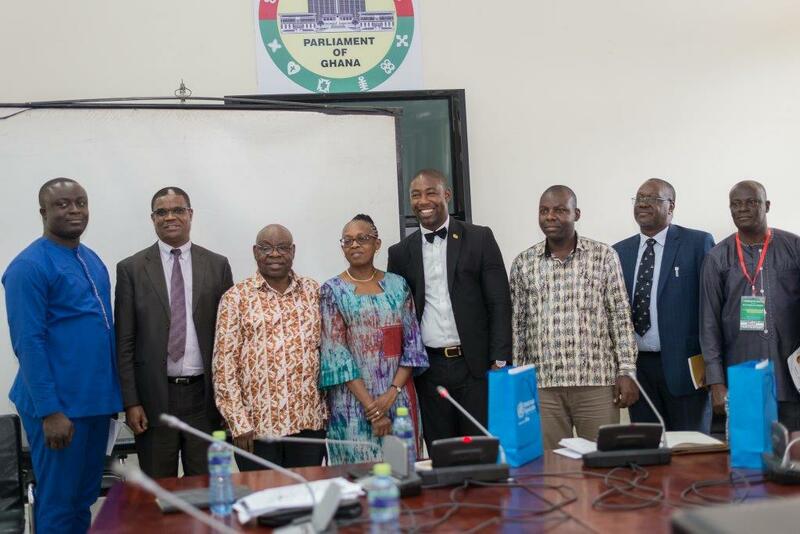 Accra, 24 April 2018: Dr Moeti and her team paid a courtesy call on the Parliamentary Select Committee on Health at the Parliament House. She applauded the Legislature for passing the LI for Mental Health Bill (MHB) and also the increase in districts offering mental health services. Dr Moeti mentioned that inadequate funding to support mental health programmes was a challenge in most African Countries, including Ghana. She however advocated for more resources for Mental Health Programmes in Ghana, since according to her was a health priority which was seriously underfunded. Dr Moeti also commended Ghana for the development of the National Alcohol Policy and multi-sectoral dialogue (MOH and Ghana NCD Alliance) on NCDs and appealed that the Legislative Instrument currently under development be passed quickly once it gets to Parliament. She commended the government’s initiative to increase access to Essential Medicines and Medical products by removing the 17.5 per cent Value Added Tax on selected imported pharmaceutical products in order to reduce their prices, to ensure accessibility and affordability. Dr Moeti stated that since the National Health Insurance Scheme (NHIS) covered 95 per cent of health conditions and was funded mainly by the National Health Insurance Levy (NHIL), there was the need for increased budgetary allocation for health service delivery. In this regard she appealed to Parliament to support the Ministry of Health to develop more great innovations for financing health. Reacting to Dr Moeti’s submission, Honourable Yileh Chireh detailed the scope of work of the committee and the proactive approaches employed to get the job done. He also mentioned that the issue with budgetary constraints was not only peculiar to the health sector but the trend was basically as a result a low revenue base for the Country. Honourable Yileh Chireh reiterated that the Committee was seriously discussing all the options regarding domestic resource mobilization to supports the health sector and concrete decisions would be taken on that. He said the automation of the NHIS claim processes was seriously under consideration bearing in mind the inefficiencies in the system. The chairman of the Parliamentary Select Committee on Health, Dr Kwabena Twum-Nuamah discussed capacity issues especially with the Foods and Drugs Authority which in his opinion needed enhanced capacity to be able to function effectively. On the challenges with health financing he was of the opinion that there was the need to identify innovative ways to increase that resource allocation to the NHIS. Finally Dr Moeti recommended the setting up of mechanisms for monitoring disbursement of funds to the lower levels on regular basis. This she said would improve health service delivery as Ghana strives to achieve UHC.